Here is another one of a kind piece of art from our engraving maching and graphic arts department. 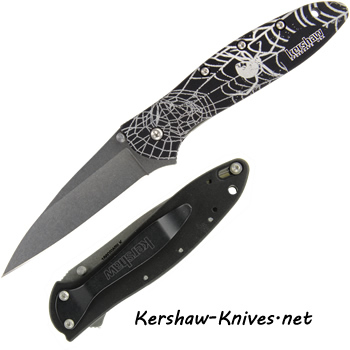 This is a Kershaw Leek model 1660SWBLK with a black widow spider and her spider web engraved on the handle. If you look close enough you will see dew on the spider web. You may also notice that the black widow is crawling on the back side of the web, exposing her trademark hourglass marking. The Kershaw Leek is a made in USA knife. It is assisted opening thanks to the Speedsafe Ken Onion opening system.